Chances are your home doesn't meet code requirements under International Residential Code (IRC) but that doesn't necessarily mean you're out of luck. Most homeowners have no idea if in fact their home is “to code”. And in terms of small work that’s been done over the years – whether it's replacing an hot water tank or replacing a garbage disposal - there’s a good chance there are non-compliance issues. Most municipalities in the U.S. have adopted a set of building codes that establish standards for properties, aimed at minimizing risk and ensuring the health, safety and general well-being of their occupants. Building Codes range from requirements for the number of electrical outlets per room to the distance a toilet must be away from the sink. Most attention is paid to new construction homes, where code inspectors will visit the property multiple times before it is completed, inspecting for each permit issued, i.e., mechanical, plumbing, electric, etc. They will inspect to ensure the foundation is installed correctly, walls are secured properly and even sprinkler systems are installed properly. Building codes can vary, depending on differences in municipalities, geography and climate, but they often follow similar standards and a homeowner can get information from their local Building Code Official. Here are answers to common questions about residential building codes. A newly built home is expected to be built to code, beginning with the plans and permits and specific items. Structural, mechanical and electrical are inspected throughout the construction process until the final inspection by the local Building Code Official and the certificate of occupancy is issued. Building code violations to existing homes doesn’t necessarily mean it has to be brought up to code, as long as you’re maintaining your home properly. And if a code violation isn’t posing a health threat or creating a nuisance to others, you may be able to let certain installations as is. It's when the size of the renovation reaches a certain level, like a creating a man cave in your basement with a wet bar, bathroom and multiple electrical outlets, that you need to contact your local Building Code Official to bring the proposed work into code compliance. Can I sell my house? Yes. Existing homes often have a number of installations that technically violate local code, though they don’t necessarily pose an immediate danger. A real estate transaction typically includes a general inspection, checking for deficiencies in the home or perhaps poor workmanship that could affect a person’s desire to purchase it or a lender’s willingness to issue a loan. Municipal inspectors, who check for code compliance, may become involved in inspection before a real estate transaction. Under the ICC’s International Residential Code for One- and Two-Family Dwellings, any lighting or electrical outlet near swimming pools, for example, must adhere to strict distances from the pool and water sources and not be positioned directly above the water, reducing the possibility for accidental electrocution and must be a GFI installation with proper bonding and grounding. On the other side of the danger spectrum, the ICC's residential code also requires any hinged shower doors to swing outward, away from the shower. Mandating that a shower door swing a certain direction intends to keep all who use it safe. 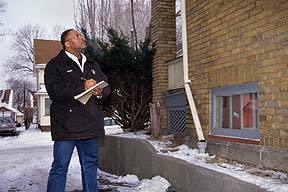 When a municipality receives a code violation complaint, the inspector will visit the property to verify if the complaint is valid. If it is, they’ll notify the property owner, telling them what corrections are needed and how long they have to correct the code violations. In the event of a code violation being found on a construction site, the Building Code Official puts a hold on all work until the correction is made. In either case – with a new or existing building – if the property owner doesn’t take the proper steps to reach code compliance, the next step is prosecution by the municipal attorney, though that is rare. Once a code violation is identified, it should be corrected as quickly as possible because there aren’t exceptions to the code adopted by the municipality, unless an appeal is made by the home owner to an established code appeal board.